When you’re away from home due to work placement or an internship it can be difficult to feel comfortable - especially when home is thousands of miles away. Whether you’re looking for a flat in Dublin because of a tech internship, a room in London for a financial consultation position, or a place in New York - we make that part easy. At FlatClub we try to make the transition painless before you arrive: we make it simple to find the right accommodation in the right location & our secure payment system means you don’t have to worry about where your money is going. Even then, once you’re actually in a new city and in a new flat - well, we can’t always be there. Here are some ways we think you can get settled in faster & start to feel at home. We’ve written an article on 10 ways to keep in touch while you’re abroad, and some of our personal favorites are listed. When you can hear a familiar voice or even better see a familiar face in your new flat, you’ll feel more comfortable. It’s a wondrous time to travel, technology has made it easy to maintain contact with loved ones no matter where you are. That’s a lot more convenient than long letters & waiting at the post office, right? If you can make a little room in your suitcase for something with sentimental value, you’ll feel more connected to home once it’s placed in your new room. Not only do objects from home remind you of home, they’re also the first step to making a new place feel like your own. If you simply can’t bring along any extras, or you don’t have anything that really fits the bill, it’s just as good to buy something home-y. Our recommendation, if your host okays it, is a candle. Purchasing a candle that has a similar fragrance to the one you use back home will instantly make you feel more at ease. If your host worries about candles being left unattended or damaging walls, spray room fragrances are another option. It might seem counter intuitive to make yourself feel more at home in a new place by leaving it, but it’s just as important that you feel confident around your new city as you do in your new home. Netflix is in all sorts of countries now, and Youtube has a surprising amount of television shows uploaded. Watching something that reminds you of evenings spent back in your home country can make symptoms of homesickness go away. If you were a huge fan of a local restaurant back home, or even a specific style of food that just isn’t common where you are now - the easy answer is for you to try & find a restaurant serving that kind of thing! However, that’s not always a solution - more often than not, foreign versions of local favorites just are not going to be up to your standards. That’s why we think it might do you better to find a new favorite meal - try some of your new city’s best rated dining choices (check Yelp for ideas) and expand your palette. You might find that different immigration patterns in your new country means much more exotic cuisine than where you come from. For instance, Americans visiting London must try Indian food - but feel free to skip most Mexican restaurants, because it just won’t be as good as home. 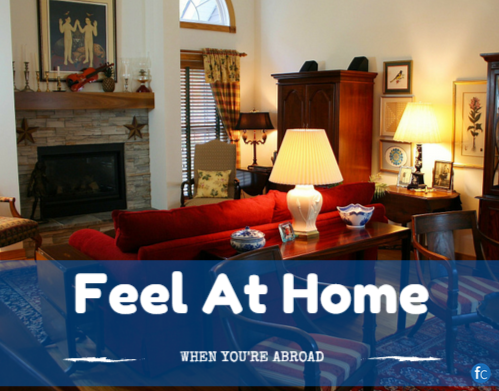 These are just some of the ways you can feel more at home when you’re working overseas. If you have any tips, please tweet us @flatclubcom, or leave a comment on the blog. Share this article with anyone you know who is struggling with homesickness!